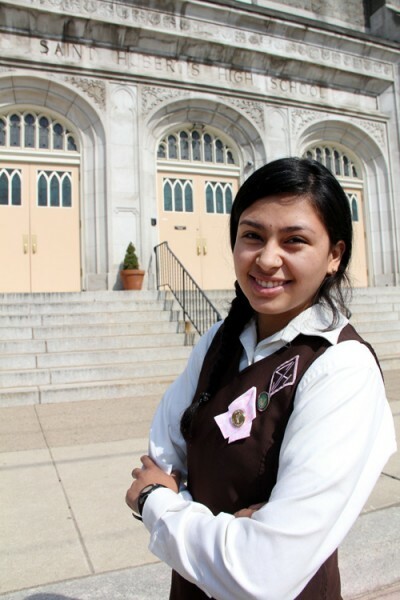 Iris Reyes-Bugg, a junior at St. Hubert Catholic High School for Girls, poses proudly in front of her school. When Iris Reyes-Bugg finished her presentation on the archdiocesan Catholic Charities Appeal at St. Leo Church in Philadelphia, the congregation spontaneously clapped. That’s unusual. People generally are not especially enthusiastic when someone is trying to get them to open their wallets. Maybe it was because she is so young – she is only a junior at St. Hubert Catholic High School for Girls but she certainly is articulate and passionate about her subject. If the congregation knew Iris’s background they probably would have clapped even harder. Born in San Juan Pueblo, Honduras, 17 years ago into a poor family with 16 children, she was adopted by her parents, Charlie Bugg and Estella Reyes-Bugg and brought to Philadelphia and raised in St. Hugh of Cluny and St. Peter the Apostle parishes. The circumstances were an international calamity. Estella-Reyes Bugg, who works for archdiocesan Catholic Social Services, encountered the family in 1998 during a visit after Hurricane Mitch which absolutely devastated Honduras. In the course of her visit she befriended the family and ultimately adopted little Iris. As a matter of fact she is now both her mother and godmother, because prior to the adoption she stood for her and a couple of her siblings at their baptism in Tegucigalpa, the Honduran capital. Iris’s childhood memories of Honduras are limited – for example visits to the nearby well for water, and the ride in the big airplane. In Philadelphia Iris’s adopted family included two older brothers and because her new mother was a native of Honduras, she grew up perfectly bilingual. Iris is comfortable speaking both English and Spanish, which is why she was chosen to give Catholic Charities presentations at St. Leo and Mater Dolorosa parishes, because both have English and Spanish Masses. Because Iris’s mother was a long-time director of the Cardinal Bevilacqua Center in Kensington, she also attended the after-school program there in her younger years, and it is one of the CSS programs she stressed in her Catholic Charities presentations. Becoming active in the parish and other outreach was also encouraged. Iris is a teacher in the PREP program at St. Peter’s, teaching the young children in grades one through three, another activity that keeps her centered. Among her other role models, she counts Msgr. Hugh Shields, the former archdiocese vicar for Hispanic Catholics, and Redemptorist Father Kevin Moley. Two years ago her mother took her back to Honduras to become reacquainted with her birth family. Her dad is dead now, but she did meet her birth mom and her seven sisters and eight brothers, who range in age from their 40s to 11. They gave her a book with everybody’s name, age, address, phone numbers and children of those who have married and now she keeps in touch. 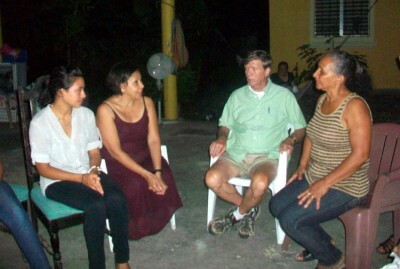 Iris (left) chats with adoptive mom and dad Estella and Charlie, and adoptive mom Purificacion (far right), when Iris visited returned for a visit to her homeland in Honduras. At St. Hubert she is a good student and a “Bambi Ambassador,” one of the students who welcome prospective future students at open houses or dances. Academically her favorite subjects are theology, English and Spanish. Even though she speaks Spanish very well, she studies it, she explains, to learn the grammatical structure and history. She has a passion for art, but knows that won’t be her career. “I’m very interested in the medical field because I think through that I can continue to give back to the community,” she said. She doesn’t see herself as a surgeon, rather as a diagnostician. After establishing herself in the U.S., perhaps she would do some volunteer work in Honduras. That’s way in the future. First there is college, and her preference would be a Catholic college, maybe St. Joseph’s or La Salle universities. Meanwhile other volunteer programs Iris has worked with are at St. Edmond’s Home for Children and currently at a rehabilitation center on Roosevelt Boulevard in Philadelphia. Clearly whatever the future holds it will include services to those with needs.